Maple Bacon Onion Jam. Does anything sound better than that? I recently had the opportunity to sample Stonewall Kitchen’s new Maple Bacon Onion Jam as well as their Roasted Tomato Balsamic Vinaigrette. One word for both of them. Amazing. The Vinaigrette is delicious drizzled on a green salad (with some bacon 🙂 ) or when used as a marinade for some summertime grilling. But let’s get back to the Maple Bacon Onion Jam. I think I’m obsessed with it. The flavor is sweet, salty, and smoky and is just what you need to take your sandwiches, burgers, and appetizers to the next level. I have so many ideas for this stuff and am thinking I may need to order a whole case of it. I can’t wait to try it smothered on a grilled cheese sandwich and I’m thinking it would taste perfect stuffed into a chicken breast with some cream cheese. It has already become one of my favorite burger toppings. 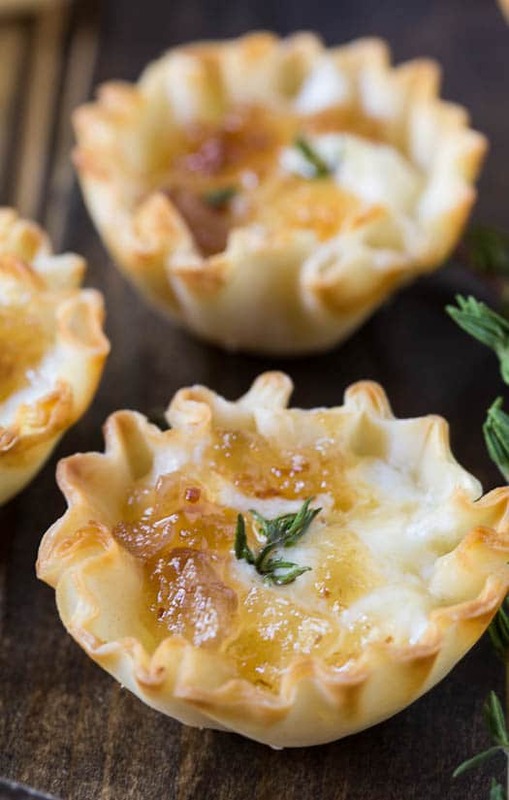 Combine it with a little mascarpone cheese or cream cheese in some filo cups for a super easy and delicious appetizer. Just bake them in a 350 degree oven until warm and lightly browned. A little fresh thyme complements the flavors. Super Easy Entertaining! 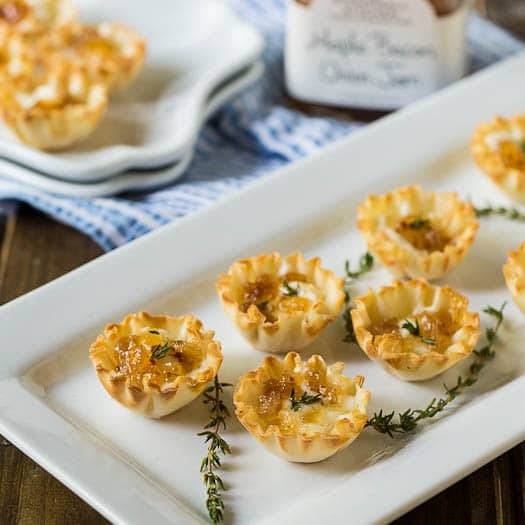 What I love about Stonewall Kitchen’s specialty food products is they can turn drab food into fabulous food just like that. Stonewall Kitchen began in 1991 selling homemade jams and sauces at a local farmer’s market and it has grown to become one of the biggest success stories in the specialty foods industry. 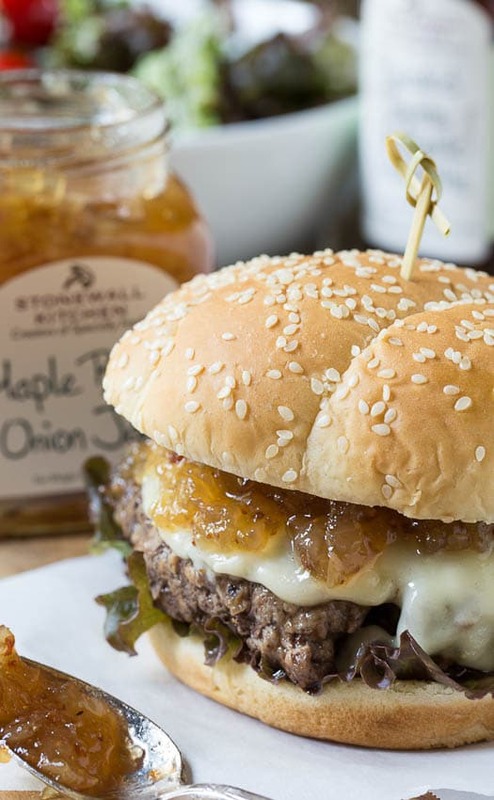 Check out Stonewall Kitchen’s huge line of specialty food products including jams, flavored oils, chutneys, salad dressings, mustards, and syrups. They are sure to add that special touch to your food and they make entertaining a breeze. Plus they make great gifts too! Now excuse me while I go and stick my finger back in that Maple Bacon Onion Jam. Simple, juicy burgers with provolone cheese and delicious Maple Bacon Onion Jam (aka the best burger topping ever). Season ground beef well with salt and pepper and form into 4 patties. Heat grill to medium-high. When hot place burgers on grill and grill 3 to 4 minutes. Flip over and cook until desired degree of doneness, placing a slice of cheese on each burger about 1 minute before removing from grill. Place a leaf of lettuce on each bun, top with burgers. Spread 1 to 2 tablespoons of bacon jam on burgers and enjoy. Corn on the Cob goes great with these burgers. Here’s THE BEST way to cook Corn on the Cob! Disclosure: I was provided with several free products from Stonewall Kitchen. All opinions are my own. This entry was posted in Dinner, Lunch, Meal and tagged bacon, burgers, ground beef, onion. Bookmark the permalink. Thank you for mentioning this jam product. Your taste is impeccable so I trust this is a great product. There’s so many condiment products out there on the shelf, so it can be hit and miss in finding the great ones (hence the value of your recommendation). I think it would be great with goat cheese and chicken. Also great in a baked brie pastry. Pork chops as well I’d imagine. Wow, this jam looks full of flavor. My husband would probably eat it on dry toast. Must be great on burgers! These are flavours I dream of. Looks amazing. Hungry now. Absolutely awesome looking burger. Great recipe and really nice pic. 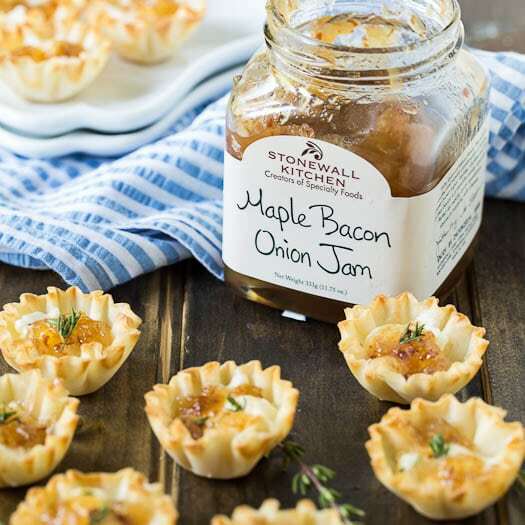 Oh how I love Stonewall Kitchen products. They have some amazing jams, spreads and sauces! This burger is making me drool over here so now I have to go get a napkin to clean up my mess! 😉 Great recipe, Christine! I don’t usually go for onion, but I’m really intrigued by this. Looks amazing! 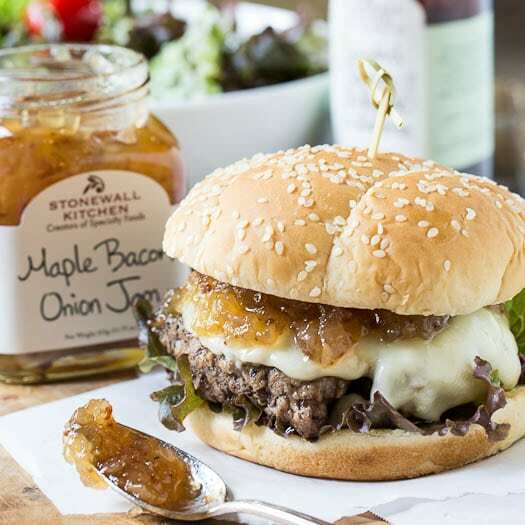 I have tried lots of Stonewall Kitchen foods, but haven’t seen this maple bacon onion jam. That sounds incredible and it looks delicious on this burger. I need to go shopping! What an awesome looking burger! We haven’t grilled in the last week and now I feel like I must do it right away!! haha Happy weekend! This jam is right up my alley! 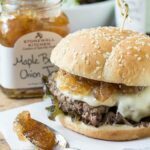 I love the addition of the maple, and a burger sounds like the perfect place to use it, along with those delicious little phyllo cups, too. I’m going to have to check that out! Oh dear – that maple bacon onion jam has me drooling! Oh wow, I can’t get over how incredible these burgers look! The photos are just stunning and that maple bacon onion jam sounds awesome! Yesssssss!!! Those burgers look amazing! The Maple Bacon Onion Jam is totally speaking my language – but that burger Christin??? Amazing!!! It looks sssooo juicy and delicious – and I love seeing that jam ooze out! That’s like the best kind of burger EVER! Oh wow this burger looks magical girl!!! That onion jam is everything! That burger looks delicious! I’m going to have to get my hands on that maple bacon onion jam. Now I want a burger and it’s only 9am. I really want some of that jam too, it looks awesome.